A total of 134,837 people came through the gates for England’s premier agricultural show. Top class animals, celebrity guests and wonderful summer weather helped make it one of the most memorable shows ever, said Bill Cowling, Honorary Show Director. The record for the highest visitor numbers was set in 2006 when 135,211 people came to the show, including HRH The Prince of Wales and HRH The Duchess of Cornwall. The second highest figure was two years ago, at 135,086. One of the highlights of the 2013 event was the gallop around the Main Ring by this year’s Grand National winner, Auroras Encore. Ridden by trainer Sue Smith, the crowds gave the world famous horse a rapturous reception and a standing ovation. Sue is the wife of Yorkshire Show jumping legend Harvey Smith. The couple were presented with a special championship rosette. 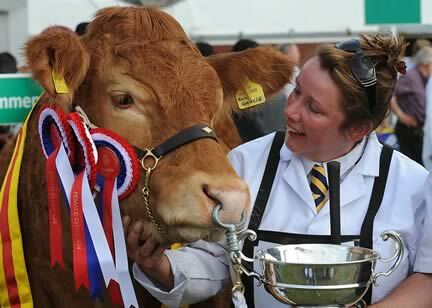 Supreme Beef: Mr and Mrs M J Alford of Cullompton, Devon with a Limousin heifer, Foxhillfarm Gracie. Blythewood Native Beef Pairs: Aberdeen Angus - Glympton Farms Ltd and HP Whittaker Farms and Co.